"Choosing a Healthy Vibrant LifeStyle"
The Alka Natural Alkaline Filter is the true alkaline filter. 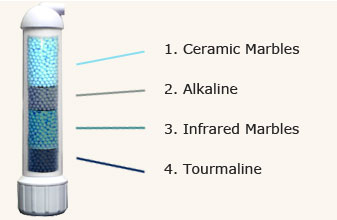 It offers premium quality alkaline water and provides far better results than ordinary calcite alkaline filters. This filter has extended benefits including the increasing the pH of tap water to 10, achieving an Oxidation Reduction Potential of -500mv, emitting far-infrared rays, and producing shorter cluster chains in the water molecule. The human body has a blood pH of 7.365 and it is essential to maintain this pH balance. Much of what we eat, such as processed sugar, meat, dairy, and coffee has an acidic effect on the pH balance. As an effect, the body has to work extra hard to restore itself to a neutral pH. Alkaline Water greatly assists in the balancing process by introducing a higher pH to the body to offset the low pH and therefore, the natural balance is reestablished. The Alka Natural Alkaline Filter has the ability to raise the pH of the filtered water to 10.5! This is an amazing property of this filter because most calcite filters can only raise the pH to 7.5. According to author Ray Kurzweil, member of the National Inventors Hall of Fame, Alkaline Water has extended benefits beyond increasing the pH of water. He states that the Oxidation Reduction Potential (ORP) is the most important benefit of Alkaline Water. The Oxidation Reduction Potential (ORP) reading is an indicator of how bio-available and bio-absorbable a product will be in your body. The lower the reading below 0 millivolts (mv), the more ions are available to assist with your body\’s metabolic functions. A very high negative ORP is desirable because it is very useful at attacking dangerous free radicals and stops them from harming healthy cells in the body. Can you regulate the level of alkalinity? How is the filter cleaned? How often do the marbles have to be replaced? Are you available fo demostrations in the Huntington Beach area?